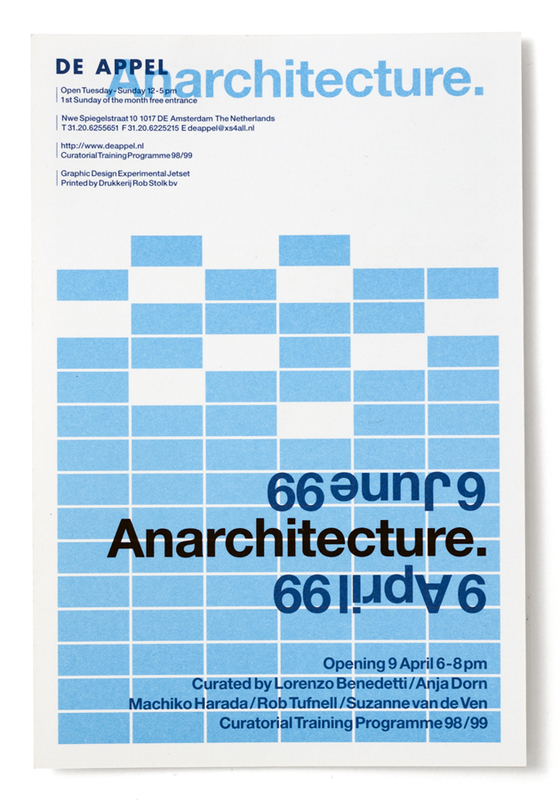 ‘Anarchitecture’ was a group exhibition that took place at Amsterdam art space De Appel, at that time still located at de Nieuwe Spiegelstraat, and headed by Saskia Bos (and not to be confused with De Appel, the theatre in The Hague). 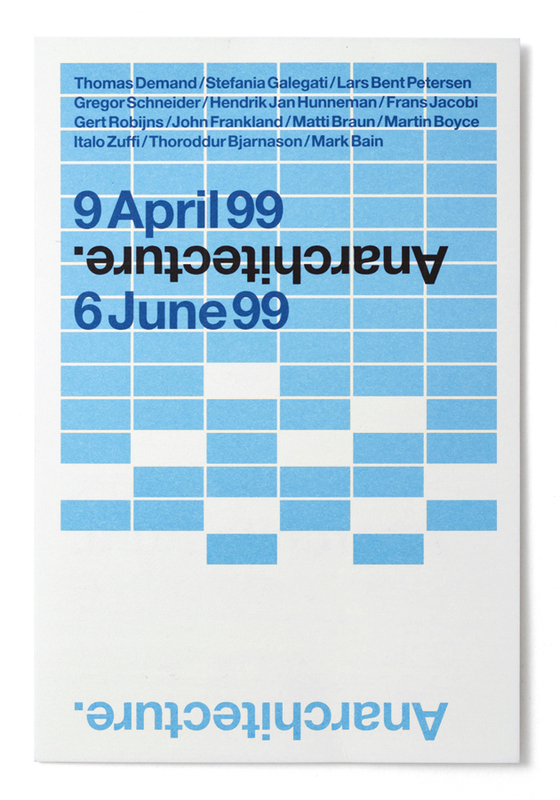 In short, the participants of De Appel’s annual Curatorial Training Program (at that time consisting of Lorenzo Benedetti, Anja Dorn, Machiko Harada, Rob Tufnell and Suzanne van de Ven) were asked to curate this group show, and approached us to design the accompanying catalogue, invitation and poster. The theme and title of the show were inspired by Gordon Matta-Clark, and the basic idea was that the invited artists (Thomas Demand, Stefania Galegati, Lars Bent Petersen, Gregor Schneider, Hendrik-Jan Hunneman, Frans Jacobi, Gert Robijns, John Frankland, Matti Braun, Martin Boyce, Italo Zuffi, Thoroddur Bjarnason and Mark Bain) would perform material interventions in the actual building of De Appel. When we talked with the curators about a possible catalogue, we sensed that they were expecting a very traditional publication – each artist his/her own spread, showing reproductions of artworks. 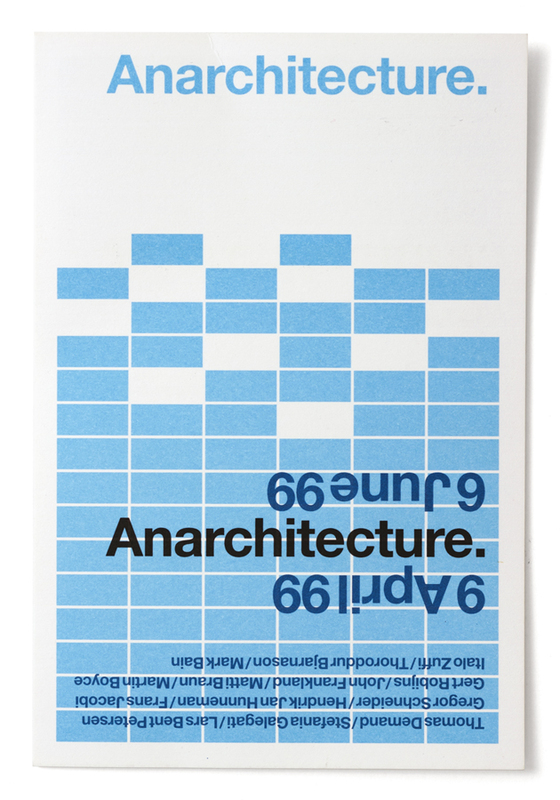 Thinking about the theme of the show (‘anarchitecture’, which can be read as a ‘portmanteaux’ of anarchy and architecture), we quickly realized such a traditional approach would not be sufficient. 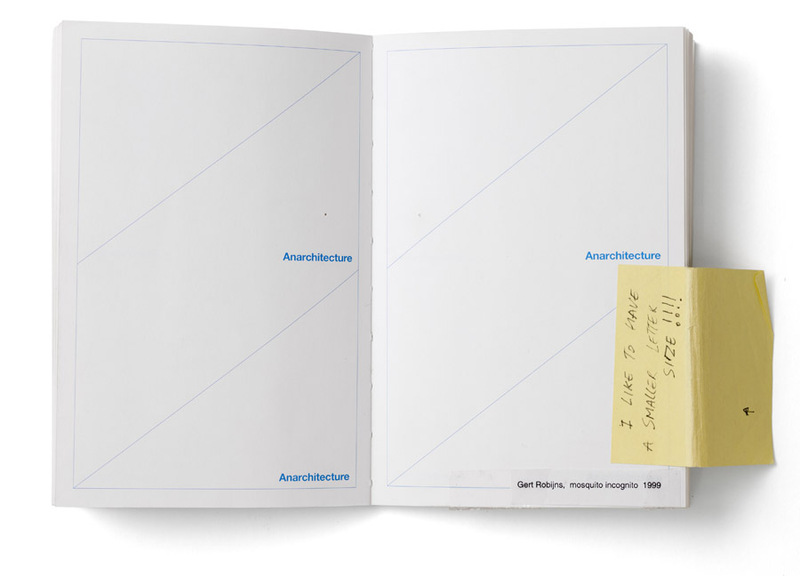 So we proposed, to the curators, a catalogue that would really follow the theme of the exhibition. 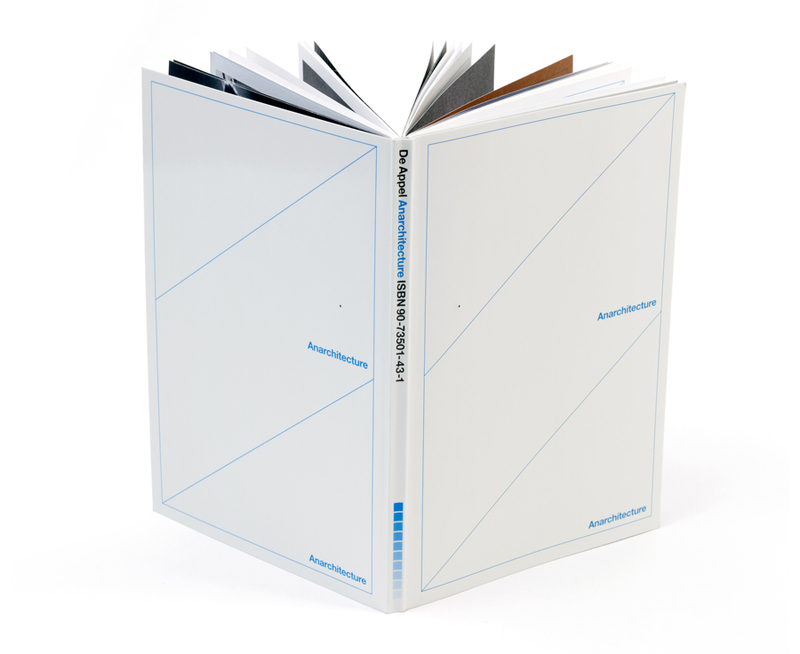 The question we asked ourselves: why not see the book as a space in itself, and let the artists perform interventions in this book, as if it was an actual exhibition space? We then sent these dummies to the artists, asking them to do interventions to the book, and then send the book back to us. 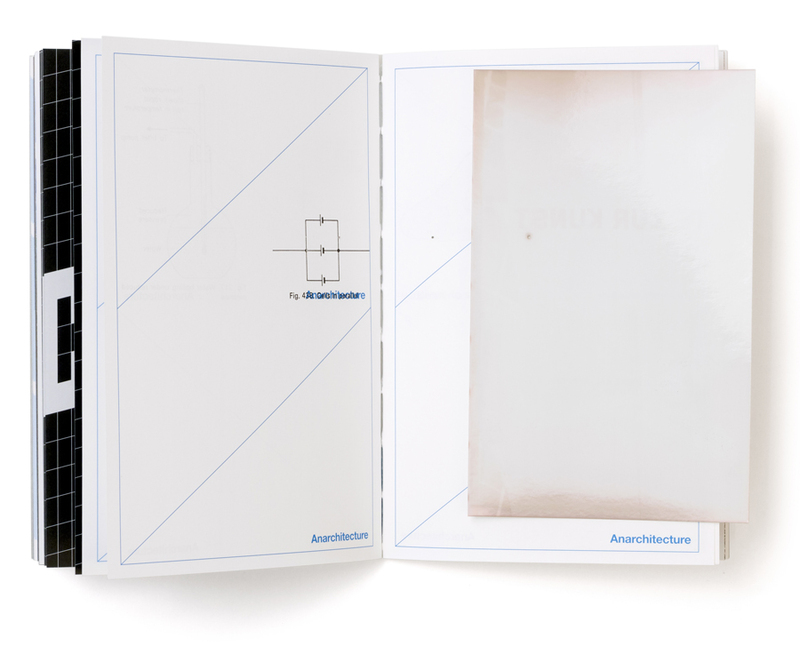 The basic idea was that we would then collect all these interventions, and put them together in one book; and that resulting book would then be the catalogue. At that time, we are quite pre-occupied with perforating printed matter ourselves (we already designed the perforated W139 invitations, and the Paradiso posters with the holes), so Robijns’ intervention fitted right in. 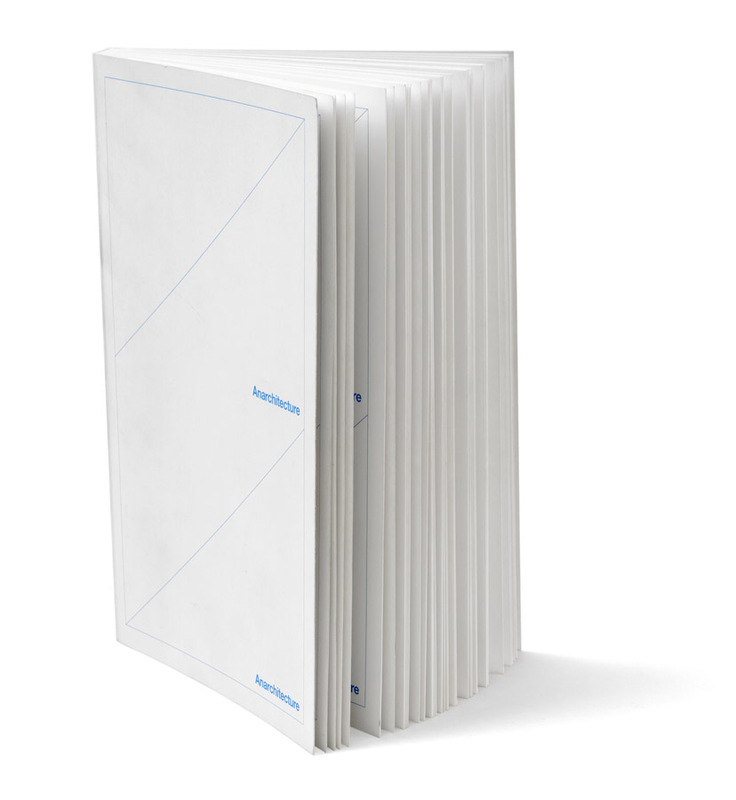 While working on the book, the budget was cut dramatically and unexpectedly – so we had to streamline some of the ideas, to make the book cheaper to produce. 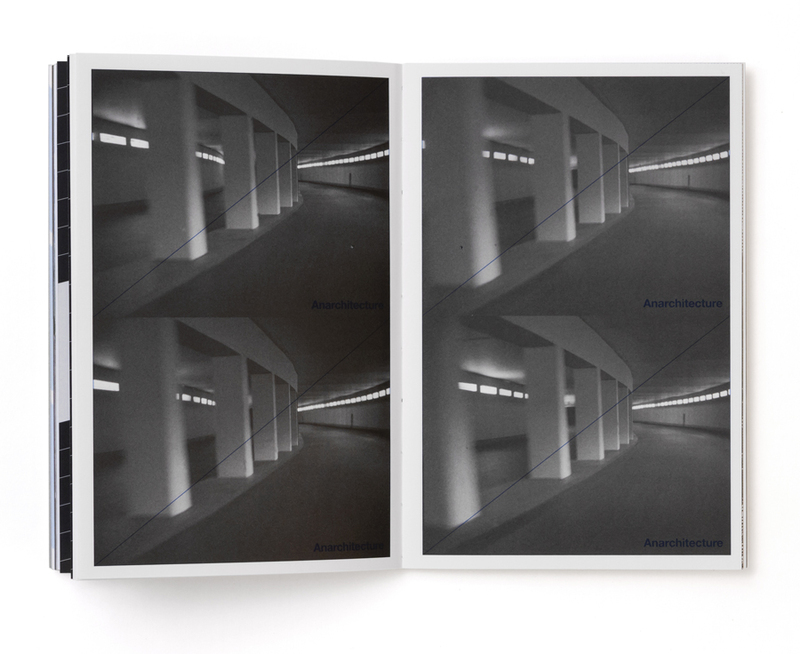 For example, instead of sticking a photograph between each page (as Frans Jacobi proposed), we decided to put all his photographs together on one single card (as a ‘photo-index’), and insert this card in the catalogue, as a separate sheet. There were actually a couple of pragmatic compromises like that. 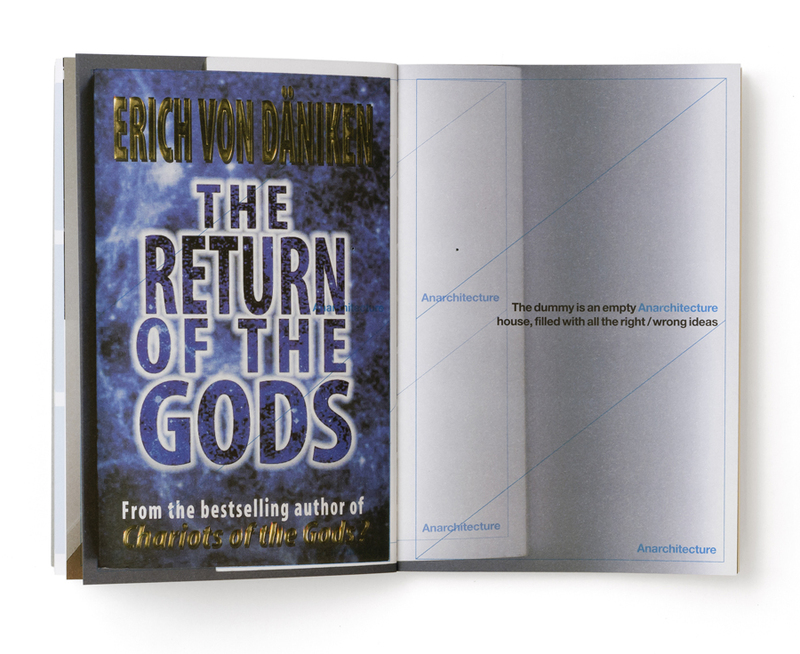 Also, because of the budget cuts, we had to include a couple of adverts in the back of the catalogue; but more importantly, the book also had to become much thinner than we anticipated. Added to that, to cut costs, we had to recreate all the interventions ourselves, by hand. (For example, we ended up drilling all the holes ourselves). We had some intense discussions with the curators, regarding the catalogue. 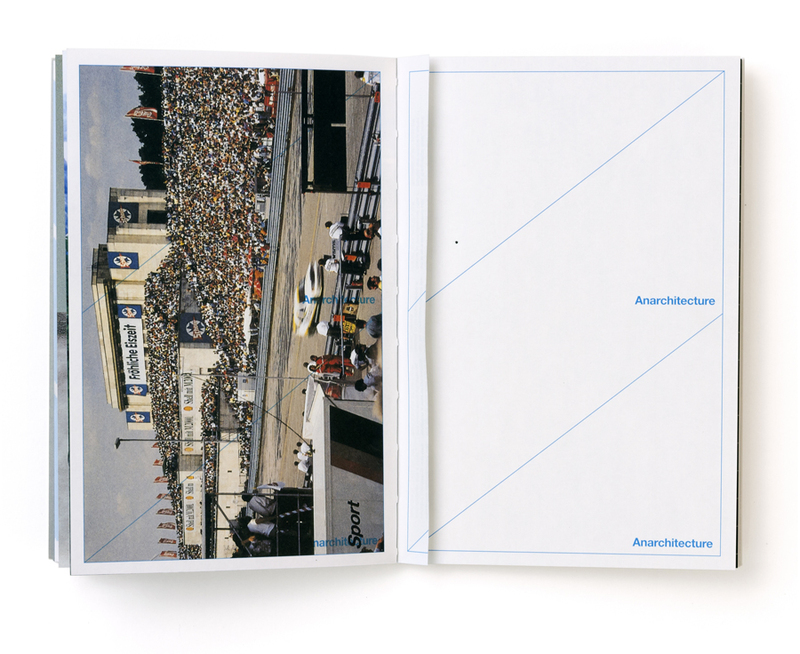 They were quite shocked to learn that we intended to keep the grid in the book, and to just print the photographs on top of it, so that the grid would be visible throughout. 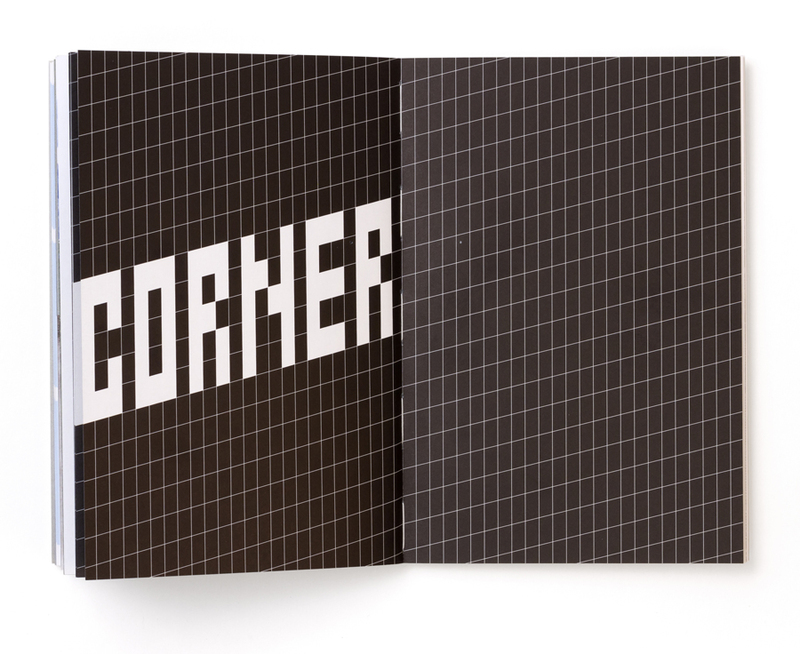 The way we reasoned, the grid was part of the structure of the book – if the artists would have wanted to get rid of the grid, they should have come up with an intervention that would have erased the grid (for example, Gregor Schneider’s cut-out page). This discussion also revealed some essential differences in opinion between us and the curators, on the nature of reproduction. 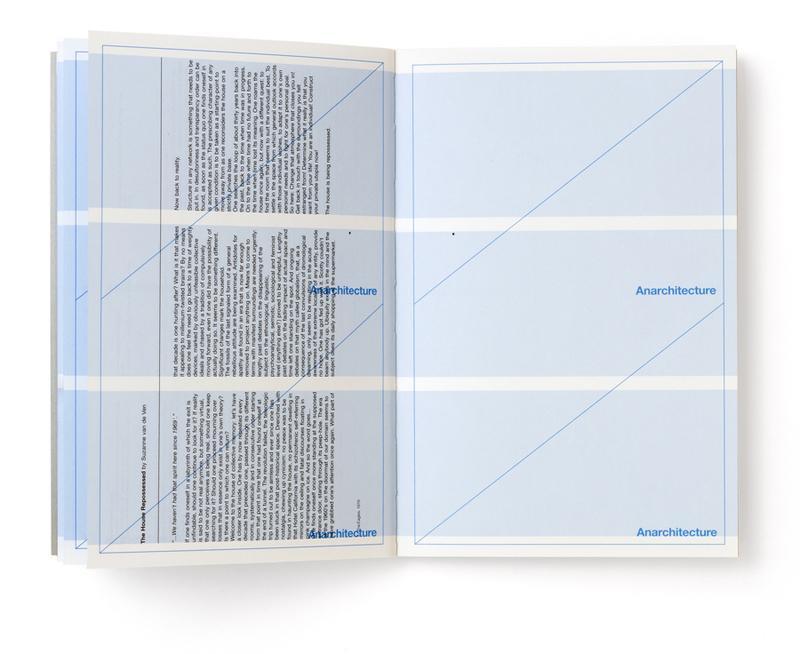 In general, we feel that a reproduction of an artwork should never be mistaken for the artwork itself – and that’s why we usually feel it’s important to add, to the reproduction, some sort of ‘Brechtian’ layer (for example, through the use of overprint, folding or perforation), in order to make the viewer aware that they are looking at ‘just’ a printed reproduction. We still remember those long talks (heated arguments, really) between us and the curators, taking place at the kitchen table (we were still working from Marieke’s living room back then). Anyway, for some reason, we actually managed to convince the curators. We were a stubborn bunch back then. As we’re writing this, we suddenly remember that we added one extra intervention to the book ourselves. On the inside of the spine (the side of the spine to which the pages are glued) we printed a sort of a secret message. It can only be read when the book is destroyed. Another example of graphic anarchitecture. 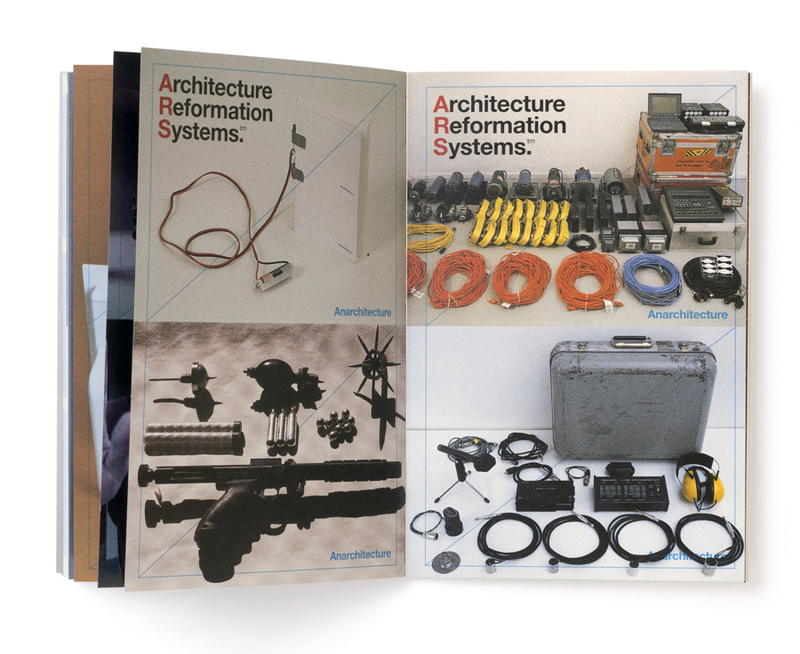 The book was published in 1999, and we just found out it can still be ordered through the website of De Appel. 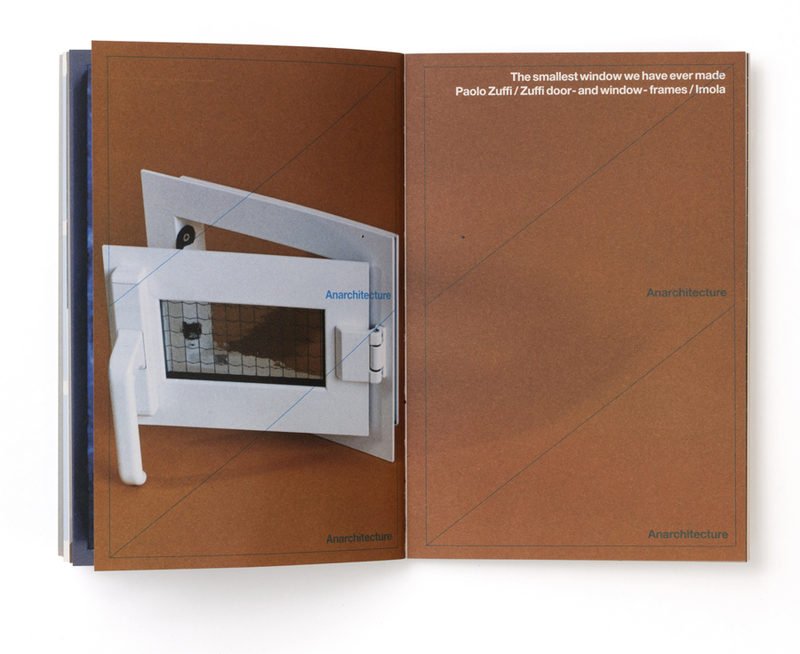 As for the other printed matter – looking back at it, we noticed that these items all seem a bit disconnected from the catalogue. 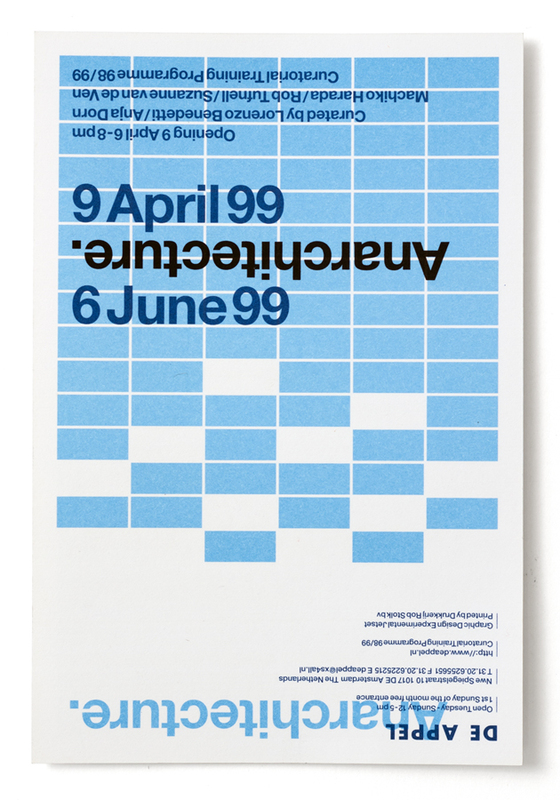 The reason for that might be that all the promotional material (especially the adverts) already had to be finished long before we started to work on the catalogue – so retrospectively, there’s not a strong conceptual link between the promotional material, and the catalogue. 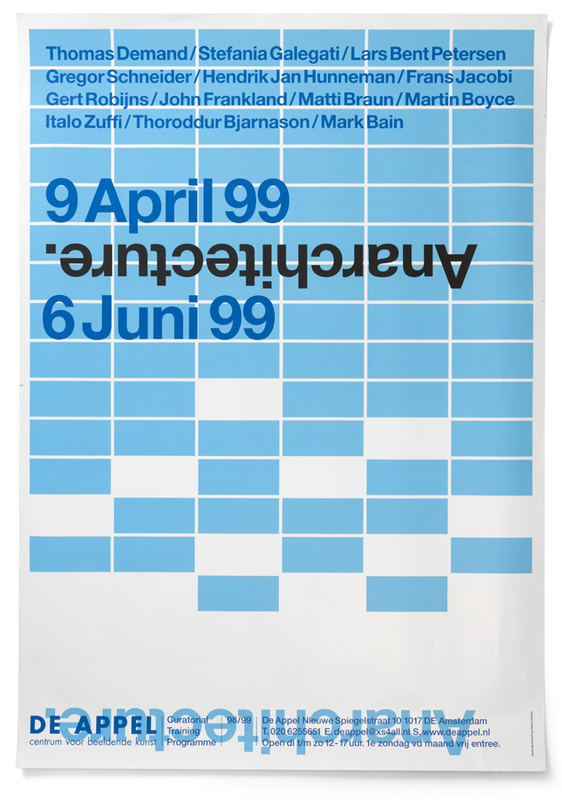 Apart from the poster and the invitation, we also designed a lot of adverts (for magazines such as Frieze, Flash Art, etc.). Going through our old Anarchitecture files, we also came across a lot of little Flash movies we made, featuring the collapsing Tetris-pattern. We can’t seem to remember anymore why we produced these animations – maybe they were shown as ‘intermission movies’, during some film-program related to the exhibition? We really can’t remember anymore. Thanks to the Curatorial Training Program 98/99 (Lorenzo Benedetti, Anja Dorn, Machiko Harada, Rob Tufnell and Suzanne van de Ven) for asking us to take part in this project.